Recently, Oracle had released a new version of Process Cloud Service. It mainly contains some minor improvements, but also has one major update: Oracle Process Cloud Service can now use Oracle Document Cloud Service for working with documents in business processes. This blog will show you how to make it happen. In the main page of Oracle Process Cloud Service, click on your user in the right-top corner and select “Administration”. On the Administration page, you click “Settings” under Configuration, which will get you where you want to be. Here you can fill in the URL of your Document Cloud Service, as well as username and password of the admin user. You can test the configuration immediately and click “Save” in the upper right corner when the integration was successful. Once the connection has been established, we can proceed to using documents in our processes immediately! During development of the process, I have done nothing related to documents, this comes automatically! Of course, it is possible to work on document settings: for example, you can set access rights while implementing the human task. You can also create document folders on the application level of Process Cloud, but for now, I have decided to go with the default setting of one folder for my application, which will automatically be created in Document Cloud. 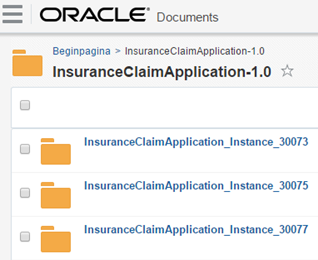 For every instance of the process, a subfolder is automatically created too, so from Document Cloud side, it looks as follows: Read the complete article here.